Put one foot in front of the other. Again and again I put myself into situations that my body feels it cannot take. And again, here I am trudging upward, ever upward. My daughter-in-law suggested that I spend the day in the National Park and thought a climb up Mt. Lassen would get me out of the house, give me a bit of exercise which I needed, and offer a chance to do some sketching without the grandchildren around. I was skeptical but she assured me it was a “walk-up”. Chip Ross Park just outside of Corvallis is a walk-up. Dimple Hill is a walk-up. Nearly everywhere in McDonald Forest is a walk-up and so I packed snacks and water and confidently headed out. Having been birthed at the foot of the Colorado Rockies, at 5280 feet of altitude, I often forget that my home base of Corvallis, Oregon, is situated at a humiliating 200 feet above sea level. I have lived here long enough that my adaptive high altitude cell structure tends to forget what it is supposed to do for me when challenged by altitudes with four and five digits. Mineral, Calfornia, where my son and his family live, is right about 5000 feet, and the trailhead for the peak is just off the highest point on the road through the national park at 8512 feet. The peak itself is 10,457 feet, only about 2000 feet of elevation gain. Piece of cake! I neglected to remember that I am a low land beast and when I got to the trailhead I discovered I had also forgotten my hiking boots. But, I had a good pair of chaco sandals and was not to be deterred. With snacks, water, and sketching supplies I set a brisk pace up the first 50 feet of the trail before realizing that I was starting out at more than 8000 feet above Corvallis. I shifted into my slow-and-steady granny gear and began enjoying the view unfolding all around me. It is an active volcano that last erupted in in 1914 and was made into a national park in 1916. It is part of the Ring of Fire, a series of volcanos that outline the Pacific Rim, including Mt. Hood, Mt. St. Helens, Mt. Rainer, and the Volcanos National Park in Hawaii. The Ring of Fire extends around the Pacific Rim through Alaska, Russia, and Asia. On this and several other trips in the area, we have explored much of the park. Several days before my trek to the top of Mt. Lassen, we put kids into backpacks and hiked a bit over a mile into Bumpus Hell. This is a spectacular active geothermal area. Once into the bowl-like caldera, we were restricted to board walks that took us throughout the area and close to many geothermal features. The earth’s crust here is brittle and thin, and cannot be trusted to support even a child’s body. We three adults were mostly busy keeping track of active toddlers who were entranced by bubbling mud pots, steaming fumaroles, and boiling lakes. This was not a time for sketching, but once we were back onto maintained trail, I opened my pocket sketchbook and painted swashes of color on several pages. I did not have my water colors with me. Instead, I wet my brush, swished it into the dirt at my feet, and approximated the hillsides surrounding me. It is illegal to remove any artifact from a national park, but a splash of authentic color was all the collecting I did. I even brushed the dried grains of dirt back onto the trail. During our lunch stop on the rim, I grabbed some contours with my pen, and used my eyes to “paint” what I saw so I would remember the vivid blues of the boiling water, greens of the trees, rusty ochers of the bare earth, and the amblings of the babies. Later, after a delicious dinner, bathtime, stories, and bedtime kisses, I was able to fill in the colors from my mind’s palatte. I pasted my mini landscapes into my journal and added notes about the people I met and the views I had captured or released. Last spring we took a day trip into Crumbaugh Lake. This three mile round-trip took us into a gorgeous valley filled with tall grass and masses of wild flowers. Our work that day was to convince a two year old that he could enjoy the flowers, but could not pick them. It was a heart rending lesson for him. They were so abundant and so precious, and he wanted all of them. The lake was pristine, but had no sandy beaches for the little one to play in. His father, on the other hand, was called to dive into the liquid snow. I still have a twinge of regret that I could not join him. Both of these wonderful trails are right off the road that meanders through the park and are clearly marked on the map provided by the park service when you pay your entrance fees. You do not have to be the hearty type to be able to enjoy many of Mt. Lassen’s spots of interest and beauty. The Sulpur Works are right beside the road with ample parking and sidewalks. You would know you were in a volcanic area just by using your nose and ears. The air is filled with the fragrance (?) of sulphur and all along the walk ways you can hear the undergroung bubbling and boiling. I did. And, it was gut-wrenchingly worth it. On the evening of my birthday, I struggled to the top of Cinder Cone, gasping for air and hoping my heart would not fail me. I crested the top and was given the most beautifully wrapped present of my life. The Painted Dunes were arrayed at my feet. Sand dunes that were painted by time and the volcanic paintbrush were aglow from the late evening sunset. 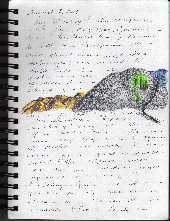 A simple sketch from last summer’s journal is open beside me. My heart swells with fullness as I see the colors trail across the page. My pencils could not duplicate it, my camera could not capture it, but it is there, in all its magical beauty. I just have to close my eyes. There is a back country lodge in Mt. Lassen Volcanic National Park. Drakesbad Guest Ranch is located in Warner Valley, down the slope from Dream Lake and on the edge of an unusual fen. A fen, I am told, is not exactly a marsh. We had a delicious dinner that catered to our two youngsters in a dining room that was a picture-postcard from the 1930’s. After dinner, with the cold mountain air urging a hasty trip home, we resisted and, changed into bathing suits, spent nearly a hour and a half in the geothermal fed swimming pool. In the dark, the October sky was filled with stars, the Milky Way, and dozens of constellations. The lodge is not open during the winter and is predominately visited by repeaters. So, if you are interested, I suggest booking early. So, did I make it to the top of Mt. Lassen? I did, sandals and all. A step at a time, and I just keep plugging along. At the top, I was greeted by Karen, a woman who had lost her visor. I picked it up along the trail, thinking that perhaps the person would like to have it at the top. She did and we shared hiking and journaling stories. She has invited me to call when I am in the area so we can do some hiking together. On the way down, I met John, from Ireland. Eighteen months ago he had been on his deathbed from anorexia. 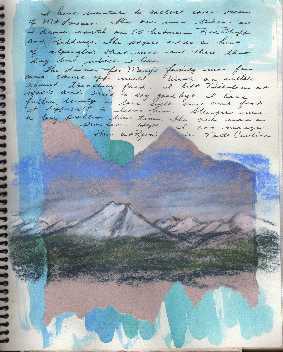 Today, his smile lit up the mountain side as he shared his relish for life and I shared my sketchbook. Off in the distance was Mt. Shasta. I painted it purple and pink in my journal. I don’t think that was exactly accurate, but it does not seem to matter. As I surveyed the park from its pinnacle, I was overwhelmed by its beauty. Even the smoke from a coastal forest fire added to the magnitude of the scene. This is truly a special place.